And bring her touch of vintage beauty and of course delicious gelato! ‘Hennie’ will always attend your event looking her best draped in bunting. She is not shy & very photogenic! She is more than happy to pose for photos with you and your guests! You can choose 5 flavours to be stocked in Hennie, from over 100!! Which are all made on-site in our store in Stratford Upon Avon. We offer a range of ‘free from flavours’, as well as vegan gelato & gluten free cones! We offer a complimentary tasting session before your event. You can come in and taste loads of flavours before you narrow it down. Hooray’s is delighted to be able to bring our award-winning gelato ice cream and sorbet to you and your guests. 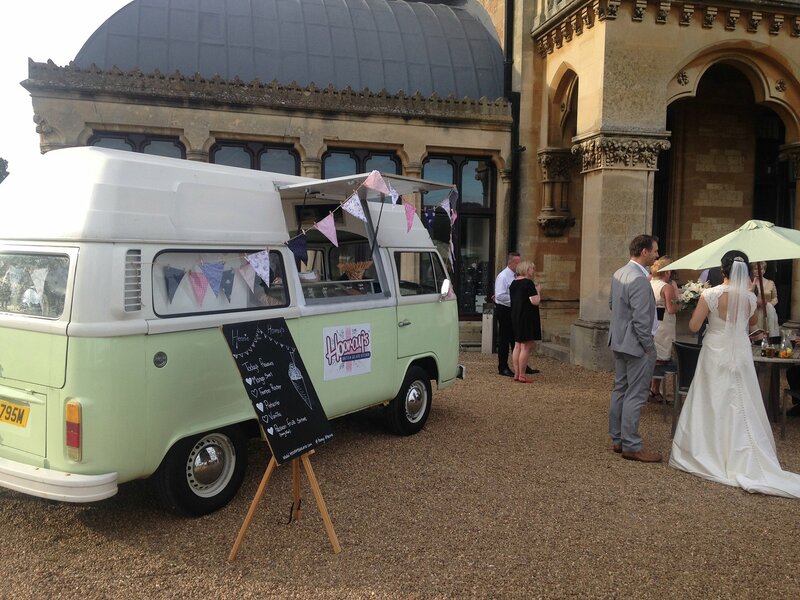 Henrietta, our super cute vintage T2 VW gelato van, is affectionally known as Hennie. Hennie was born in 1974 which makes her vintage, but she’s looking great for her age. She’s super cute… and a bit of a poseur. She loves going parties and special events, she’ll get all dolled up for any occasion day or night. 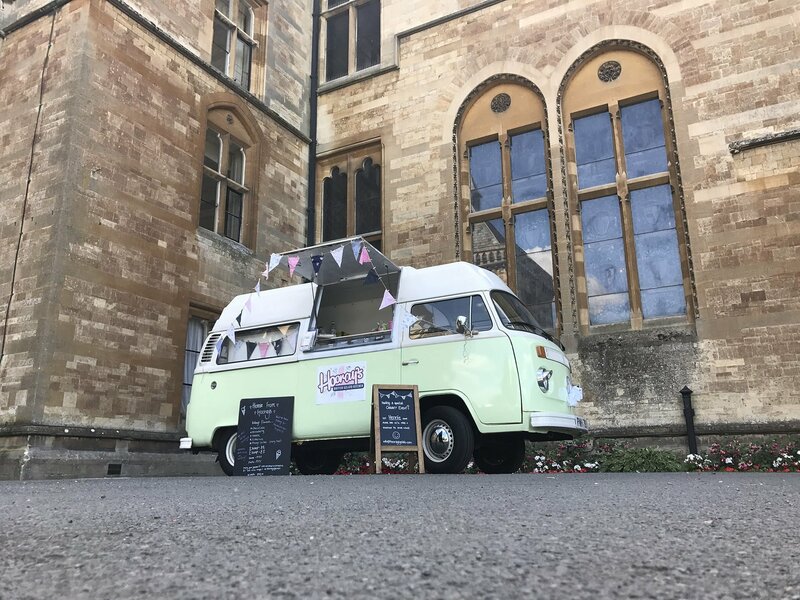 She’s been beautifully fitted out so the Hooray’s experience can be enjoyed out and about in Stratford upon Avon and the surrounding area, up to 20 miles away. If you’re not in a 20 mile radius of Stratford upon Avon, we may be able to attend your event, but there will be a little extra charge. 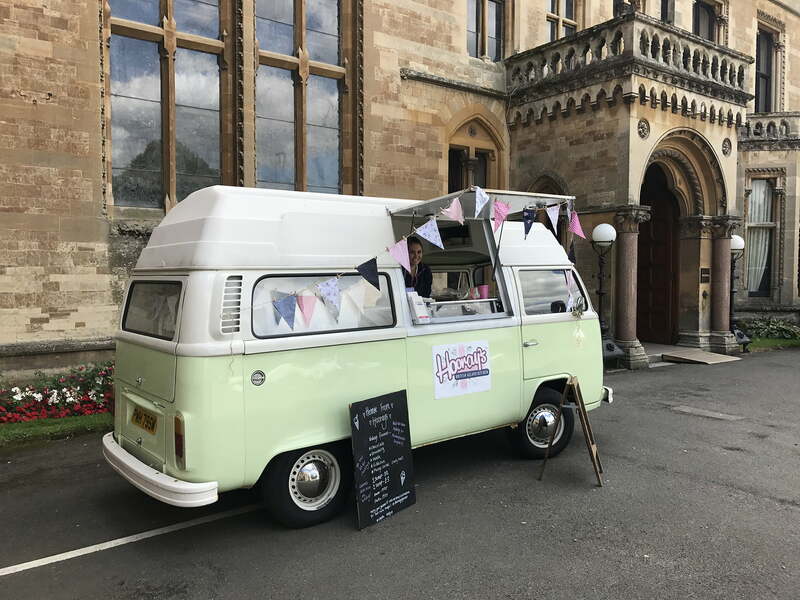 Hi, I just wanted to say a huge thank you for yesterday the ice creams were amazing and everyone loved it. I think we might have to make it an annual event! We make all our own gelato ice cream and sorbets on the premises at Hooray’s British Gelato Kitchen in Stratford upon Avon, we have a grade 5 food & hygiene certificate. If you or your guests have any allegery issues, please let us know. We cannot guarantee that our products will be completely allergen free. Hennie also does an all you can eat package for £600 where you and your guests can enjoy unlimited* gelato for 1.5 hours. We require full payment no later than 8 weeks prior to your event. As well as your final guest numbers and Gelato choices. If you would like us to travel a little further, contact us for a quote. If your event is at a hired venue please check that they are agreeable to Hennie’s presence before booking. Hennie will need to be parked on private land, it is illegal for her to be parked and serving on a main road or pavement, unless you have been granted a licence by the council responsible for the land. Please keep in mind, although Hennie looks fabulous, she is a vintage vehicle and will need a wide, tall generous access. We reserve the right to refuse any manoeuvre that are either impossible or likely to cause damage to the vehicle. Your booking is not confirmed until the deposit has been paid. All balances must be paid at least 8 weeks before your booking. If you book within 8 weeks of your event full payment will be required at the time of booking to guarantee the date. If your balance is not paid by the due date we will send you 2 email reminders after which time your booking will be cancelled and your deposit will not be refunded. Cancellations up to 12 weeks before your booking date will have deposits refunded, no deposits refunded for cancellation after that time. Please make sure you have permission from your venue for Hennie. If we are refused entry you will lose your booking. No refund will be issued. Hennie is a Private Hire Vehicle, we do not have a street licence, please make sure you make arrangements with your venue for Hennie to be parked on Private Land, that does not block a pedestrian right of way, endanger your guests or block a road. We will not be able to carry out your booking if legal parking arrangements have not been organised. You will not be refunded. We reserve the right to refuse any vehicle manoeuvre, which is either impossible in a heavy vintage vehicle or may put the driver or vehicle at risk. Hennie weighs 3 tonnes and does not have power assisted steering. She is also tall and wide. For these reasons she does need room to manoeuvre. Please contact us for dimensions if required. If the ground is very soft Hennie will sink, if you and your guests would prefer not be pushing a 3 tonnes van out of the mud! Please ensure there is an alternative hard standing area to park Hennie after excessive bad weather. Abusive, aggressive behaviour will not be tolerated and if we feel threatened in any way we will leave the premises immediately. You will not be refunded. We cannot guarantee that any of our products are completely free from any allergen. Due to the way it is made there is always a possibility of traces. If you or any of your guests suffer from any allergens, you are required to make us aware prior to the event. Alcoholic sorbets do contain alcohol; although you would need to eat a lot before being unsafe to drive, we will not serve these to the under 18s.